When the Penn Family founded Carlisle in the 18th century, they set aside one plot of land to serve as an African American burial ground, and one plot of land for a white cemetery. The African American burial ground, later to become known as Lincoln Cemetery, was 300×100 ft and had poor drainage. The white cemetery, referred to as The Old Cemetery, was 5 acres. Carlisle Borough officials were tasked with maintaining both cemeteries. They only kept up with The Old Cemetery. Throughout the 19th century, hundreds of African Americans were buried in Lincoln Cemetery. Those buried include Carlisle residents (like Samuel A. Jordan, and Elizabeth Peck), and soldiers of the Union Army in the Civil War. Most notable are members of the 54th and 55th Massachusetts Infantry Regiment, the first black soldiers allowed to fight in the United States Army. There are also three soldiers from World War I, but Lincoln Cemetery largely stopped accepting burials in the early decades of the 20th century. 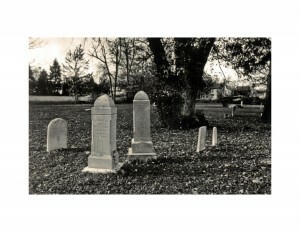 For more images of Lincoln Cemetery, visit the House Divided Project. Joseph Cress, “Local Woman Saving Memories through Book,” The Sentinel, October 30, 2011. Accessed via “Lincoln Cemetery (Carlisle)” drop file, Cumberland County Historical Society, Carlisle, PA 17013.